March First Friday will have a very special added attraction when the Ashland Gallery Association celebrates student art. Each year the AGA hosts a student show. Alongside art by well-known local, regional and national artists, a dozen galleries will feature works by budding young student artists from the Fine Arts Department of Ashland High School. During the First Friday Art Walk on March 6th, and throughout the month of March, visitors to AGA galleries will be dazzled by the beauty and uniqueness of the art made by these creative young minds. There will be paintings, drawings, mixed media, fiber arts, special woodworking and jewelry pieces as well as photography on display. 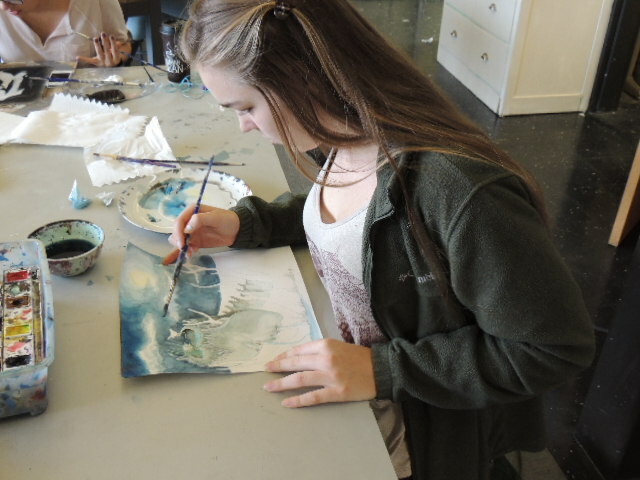 Uptown, downtown and Railroad District galleries will participate in the student art show. Participating galleries include: Adelante! Gallery, Art & Soul Gallery, Ashland Art Works, Creekside Pizza, Enoteca Wine Bar, Nimbus, Oak Leaf Studios, Push Gallery, Studio AB, as well as the SOU student-run gallery in the basement level of the Marion Ady building on the University Campus. These galleries will host the following 23 local high school students: Alex Roberts, Alli Haynes, Clara Baxter, Dannae Stewart, David Lehrburger, Ellie Stanek, Ivy Connelly, Kianna Stupakoff, Kreshana Belias-Baker, Lars Filson, Mariposa Tratensek-Contor, Mel Elshalom, Miriam Alba Ochoa, Raven Borgilt, Reid Higley, Samara Diab, Sarah Lynch, Sonora Jessup, Sonora Mindling-Werling, Stephanie Kutcher, Sunshine Love, Tereza Stott, and Theo Whitcomb. On the evening of March 6th, during First Friday events, the student artists will be present at their hosting gallery from 5:00-8:00 p.m. to proudly discuss their work. All are invited and the community is encouraged to support these emerging artists by visiting the galleries.